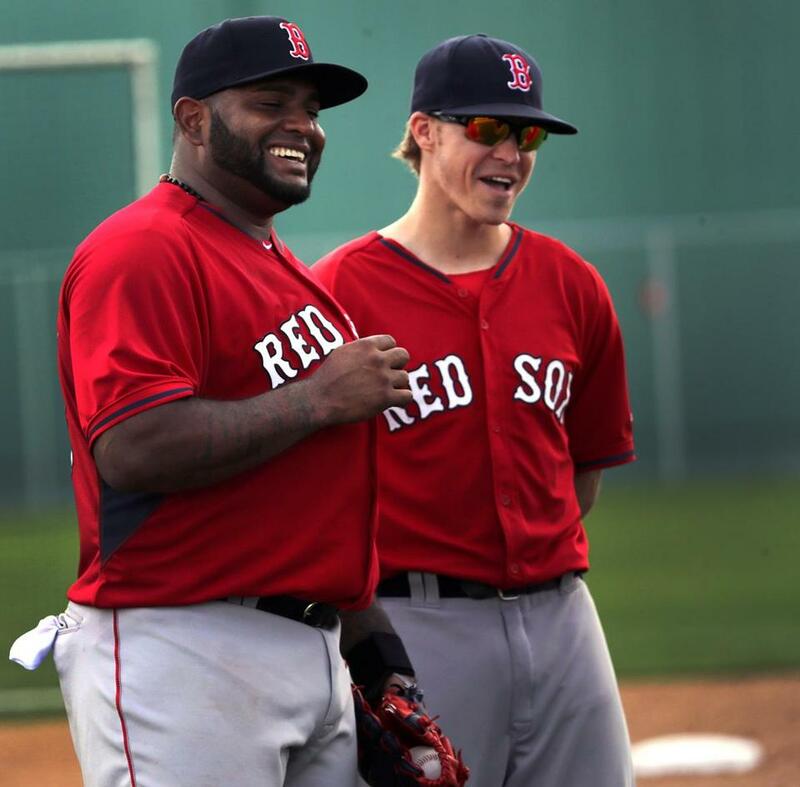 Pablo Sandoval (left) has been a sunny presence in camp, even helping with the instruction of younger players such as Brock Holt (right). FORT MYERS, Fla. — Pablo Sandoval seems like a jovial sort from afar. He has an amusing nickname and isn’t ashamed of the extra pounds he carries under his jersey. 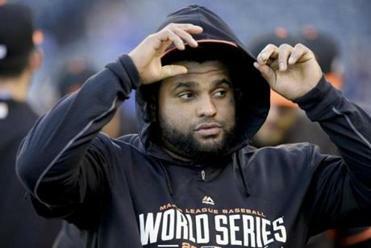 The Kung Fu Panda is more likely to shake his head and smile after a strikeout than pout, and the fans in San Francisco embraced him for that. The new third baseman of the Red Sox also has a stubborn and sensitive side that has emerged in recent days. Sandoval told Bleacher Report he left the Giants in anger, still bothered by the way he and his agent were treated last spring during contract negotiations. He went so far as to say he knew he would leave before last season started and would miss only manager Bruce Bochy and outfielder Hunter Pence. Assistant GM Bobby Evans insists that the Giants made every effort to re-sign their popular third baseman. “Just those guys,” Sandoval said. On Tuesday, Sandoval wasn’t interested in softening his comments, answering several questions by pointedly saying how much happier he was with the Red Sox. “Nothing to say. I’m happy to be in Boston,” he said. “I’m feeling at home right now. Whatever I said, whatever has come out, it’s the truth. So I’m just happy to be here with my new team to try and bring a lot of things to them. The story isn’t quite that simple. On Oct. 31, after the Giants celebrated their World Series title with a parade in San Francisco, Sandoval said he wanted to stay with the team. The Giants responded quickly. “We made our first offer the day after the parade,” assistant general manager Bobby Evans told the Globe. Evans, who does most of the negotiating for the Giants, remembers no particular angst by Sandoval at the time, only a desire to sign a long-term deal. The Giants offered a four-year extension during spring training with a reasonable vesting option, according to Evans. That deal was worth just under $85 million. The offer went to approximately $95 million after the World Series. Sandoval signed with the Red Sox in November for five years and $95 million with a team option for 2020. The Giants, Evans said, were willing to raise their offer. “I was never given any indication that Pablo was ‘done with the Giants,’ ” Evans said. “In fact, he was apologetic that he could not accept our offer at the time and that he needed to wait, and he expressed to me that he wanted to stay with the Giants. And we certainly wanted him to stay with us as well. Sandoval acknowledged that he could have received a better deal with the Giants but decided to leave the organization after 12 years and three World Series titles. Boston, he thought, fit him better. Does that suggest the Giants didn’t treat him correctly? “Like I said, I’m happy to be here,” Sandoval said. Evans isn’t letting the comments change his opinion of Sandoval. “I don’t take what he said literally. I give him the benefit of the doubt. He’s an emotional guy, very passionate about the game. I don’t hold this as an example of who he is. Through nearly three weeks of spring training, Sandoval has been a sunny presence with the Red Sox. During the first few days of camp, Sandoval went to Farrell and infield coach Brian Butterfield seeking permission to instruct younger players at third base. He has since worked with Garin Cecchini, Sean Coyle, and Brock Holt, and even shortstop Xander Bogaerts. Sandoval said his spring is going well and he’s working on the usual adjustments. His new teammates are “fantastic” and he even likes spring training in Florida more than Arizona because of the beaches. The Giants say they felt that way, too. That Sandoval didn’t think so proved to be beneficial for the Red Sox.